The Prodigy has thanked fans for turning out to celebrate the life "of our brother Keef". Thousands of music lovers lined the streets in tribute to frontman Keith Flint, 49, who was found dead at his home near Dunmow, Essex, on 4 March. On Sunday, bandmate Liam Howlett described the funeral as "truly emotional and overwhelming". Flint's funeral was held at St Mary's Church in Bocking, Essex on Friday. Howlett, along with other band members Maxim and Leeroy Thornhill, were met by cheers when they arrived at the service. 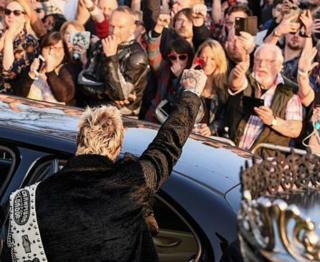 Before the funeral, the band had called on fans to "raise the roof for Keef" and line the route of the funeral procession through the singer's hometown in Braintree, Essex. Howlett thanked fans for their support, saying they "did him proud". He said on Twitter: "I would like to thank everybody that turned up to celebrate the life of our brother Keef, it was a truly emotional and overwhelming day. "Thankyou for your support, you did him proud, much love and respect LH x." The 1.5-mile procession started at 15:00 GMT and fans from around the world gathered to pay their respects. The band, who released their latest album No Tourists in November, had been due to tour the United States in May.